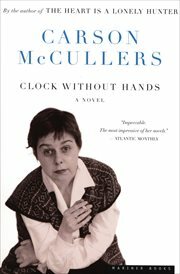 The item Clock without hands, Carson McCullers, (ebook) represents a specific, individual, material embodiment of a distinct intellectual or artistic creation found in Charlotte Mecklenburg Library. An "impeccable" novel about race relations and responsibility set in the civil-rights-era South, by the author of The Heart Is a Lonely Hunter (The Atlantic Monthly). Set in Georgia on the eve of court-ordered integration, Clock Without Hands contains McCullers's most poignant statement on race, class, and justice. A small-town druggist dying of leukemia calls himself and his community to account in this tale of change and changelessness, of death and the death-in-life that is hate. It is a tale, as McCullers herself wrote, of "response and responsibility-of man toward his own livingness."